Seitan and vital wheat gluten are magical. They are. They let us make food that is so close to animal meat, it’s scary. They add stretch and elasticity to food and give it that “chewy” texture we want in burgers, cutlets, steaks and more. But what happens if you’re gluten-free? Beyond Meat is amazing but I can’t get it where I live so I had to figure something else out. 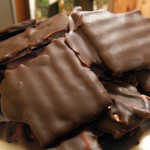 I have made recipes for gluten-free versions of the foods that usually contain gluten. You all know about my Gluten-Free Italian Sausage and Breakfast Sausage. If you don’t, check them out. They are very popular. I have made burgers with all types of beans, TVP, eggplant and lentils. They are all delicious. 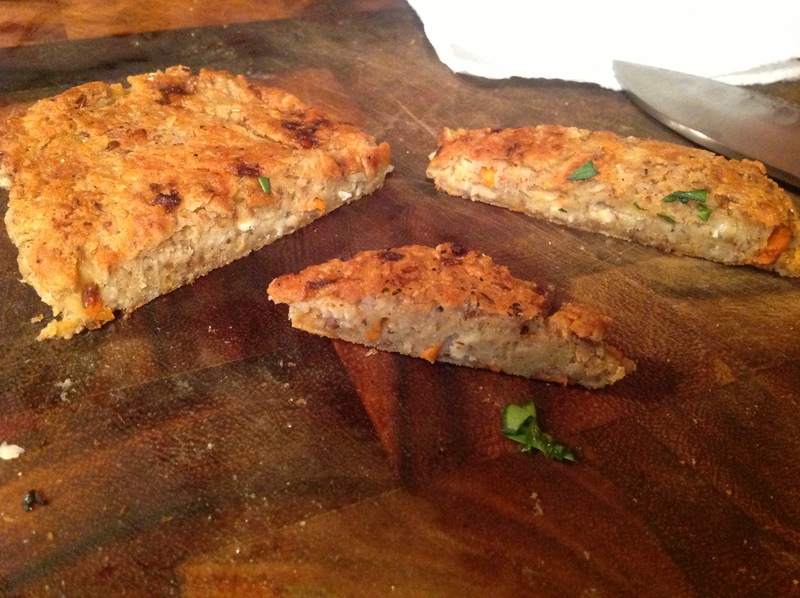 My Sorta Seitan Cutlets use only 25% of the gluten that regular seitan uses and they are amazing. But I wanted a gluten-free version of seitan. I searched the internet. 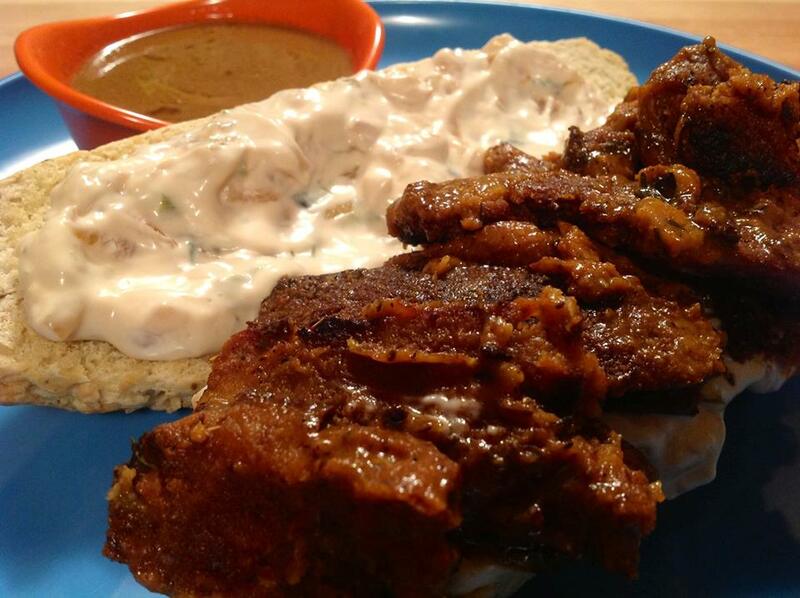 There are some gluten-free seitan recipes out there. I tried them all. I hated them all. I’m serious. None of them tasted like seitan. None of them tasted like meat. I know I can’t expect something that doesn’t have gluten to taste exactly like seitan but these recipes weren’t even close. They all tasted like bread. 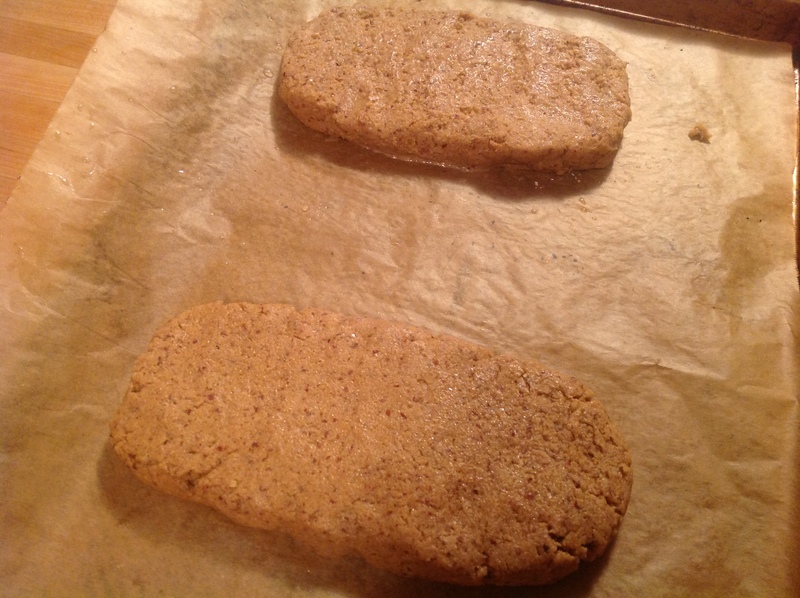 I wasted a ton of ingredients and threw whole loaves of gluten-free seitan in the garbage. There is a boxed mix of gluten-free seitan you can buy but it’s just full of starches and sounds really unappetizing. 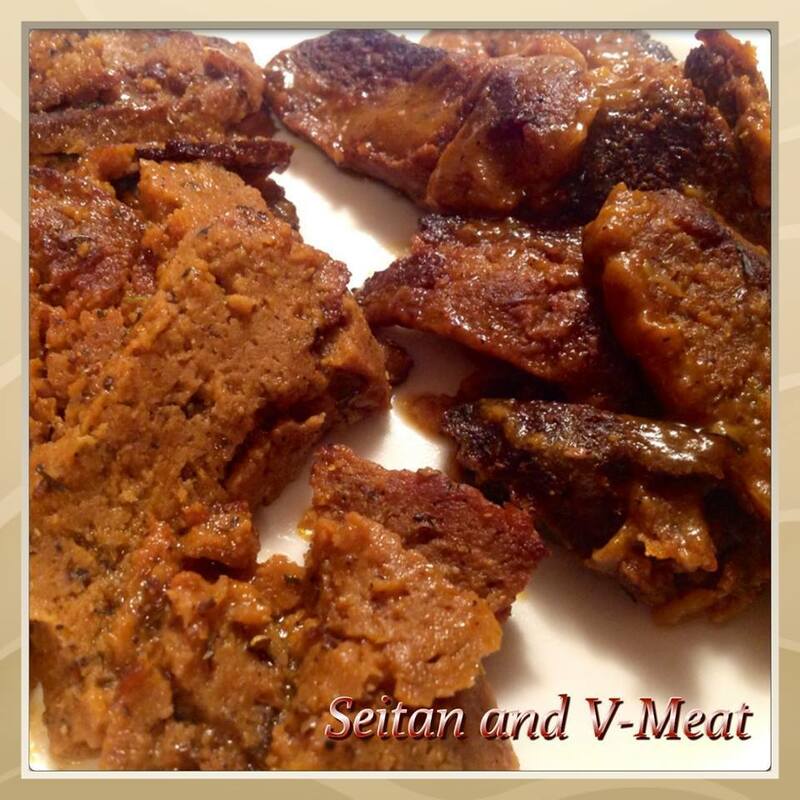 Seitan and V-Meat. Which is which? Can you tell? It doesn’t have the elasticity of gluten but it does have a similar taste, especially when prepared into dishes. Like seitan, you don’t just make it and eat it. You have to use it in recipes, season it, cook it, make it savory and delicious. After all, it is just dough so you have to season it generously and infuse the most flavor possible. It can be formed into patties, balls, logs, cutlets, steaks, roasts and it can be sliced. I have used it to make French Dips, Pot Roasts, Stuffed Roasts, Burgers, Ribs, Sausages, and more. Here are some pictures that show how I have used it. It’s one basic recipe and then you can change up the seasonings and flavors to make it however you like. V-Italian Sausage can become V-Breakfast Sausage by switching from spicy seasonings to the ones usually found in breakfast sausage like maple, apple and sage. The possibilities are endless. V-Meat is gluten-free. It contains oats so make sure to get certified gluten-free oats if you have celiac disease or are gluten-intolerant. I tried to make it without oats. I tried quinoa, rice and millet but it didn’t work right. Oats gave it that “chew” that other grains didn’t. If you need V-Meat to be soy-free, you can simply swap out the soy flour for quinoa flour or rice flour and use Bragg’s coconut aminos instead of soy sauce (when it’s needed). But I will say that I made a few soy-free versions and it does taste a little better with the soy. One thing that really surprised me: chickpea flour, my favorite flour, the flour I think runs through my veins (if flour could run through your veins) DOES NOT WORK. I made a million batches with it and couldn’t figure out why it tasted so much like bread. I thought it was the other ingredients. Then I took out the chickpea flour and TA DA! It was so much better. Don’t use chickpea flour. High-protein flours are needed like soy flour, amaranth flour and pea protein and I added very little starch. I use arrowroot but you could use corn starch or tapioca starch. It does need the xanthan or guar gum. I tried it without it. It doesn’t hold up. 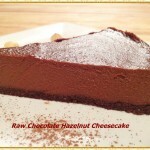 Every ingredient that is in my recipe is there for a reason. By the way, you can find pea protein in health food stores, natural markets or online at Amazon, Vitacost, Swanson Vitamins and any place that sells health and fitness products. When you make the dough, you could just fry it right up but it tastes much better if you steam it first. It really solidifies the ingredients so you can do whatever you want with it afterwards. You also don’t have to wait hours to use it but again, it tasted a bit better to me when I did. I hope you have fun with V-Meat and the other versions. 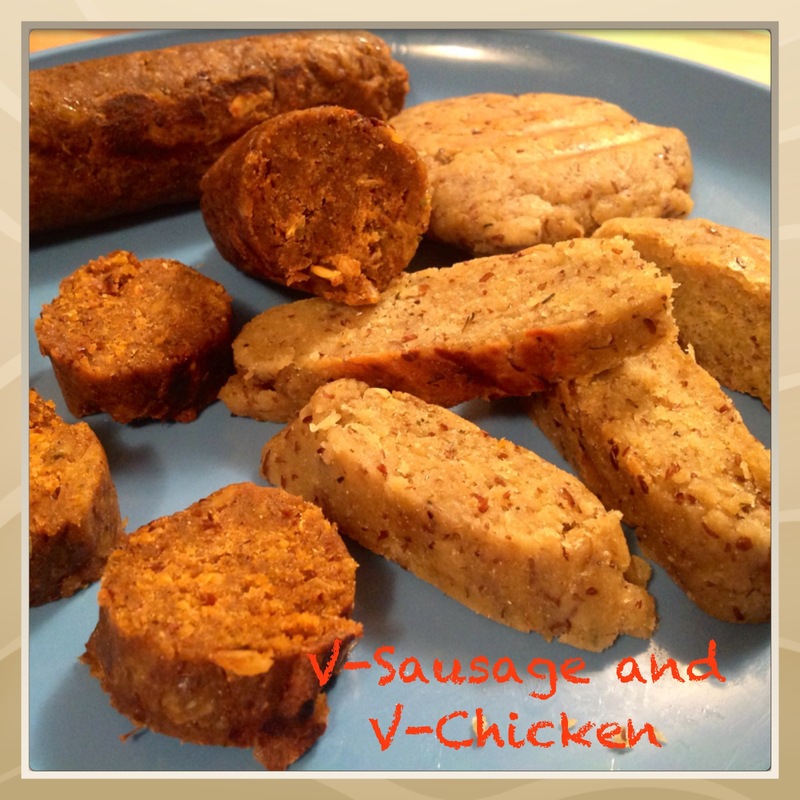 V-Chicken and V-Sausage are my personal favorites. All of the versions have been meat-eater approved! Please share with us what you do with it. I really hope it adds another choice to your menu. Enjoy! Set up a pot of boiling water with a steamer inserted. In a small saucepan, dissolve the bouillon cube in boiling water to make “beef” broth. 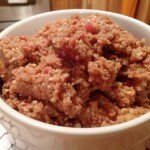 In a bowl, combine the rolled oats and 1/3 cup of broth. Mix and let sit for 10 minutes or until the broth is completely absorbed. Set aside. In a smaller bowl, combine the vegetable oil, tomato paste, tamari, nutritional yeast, flaxseed, seasoning and 1/3 cup of broth. Mix well to combine. Add the cooked oatmeal to the wet ingredients and stir until everything is well combined. Add the wet ingredients to the bowl with the dry ingredients. Using a rubber spatula, mix until you have a dough. Then wet your hand and knead the dough in the bowl until it feels smooth and holds together. If the dough feels too wet or loose, add more soy or amaranth flour. If the dough feels too dry, wet your hands and knead rather than adding water to the dough. You add less water this way. When you are happy with the consistency of the dough, let it rest for 10 minutes. It should be a bit sticky and not too dry. In a smaller bowl, combine the vegetable oil, nutritional yeast, flaxseed, seasoning and 1/3 cup of broth. Mix well to combine. Add the cooked oatmeal to the wet ingredients and stir until everything is well combined. Add the wet ingredients to the bowl with the dry ingredients. Fold in the carrots. Using a rubber spatula, mix until you have a dough. Then wet your hand and knead the dough in the bowl until it feels smooth and holds together. If the dough feels too wet or loose, add more soy or amaranth flour. If the dough feels too dry, wet your hands and knead rather than adding water to the dough. You add less water this way. When you are happy with the consistency of the dough, let it rest for 10 minutes. It should be a bit sticky and not too dry. Set up a pot of boiling water with a steamer inserted. Heat the vegetable broth until boiling. Prepare the spice mix and set aside. 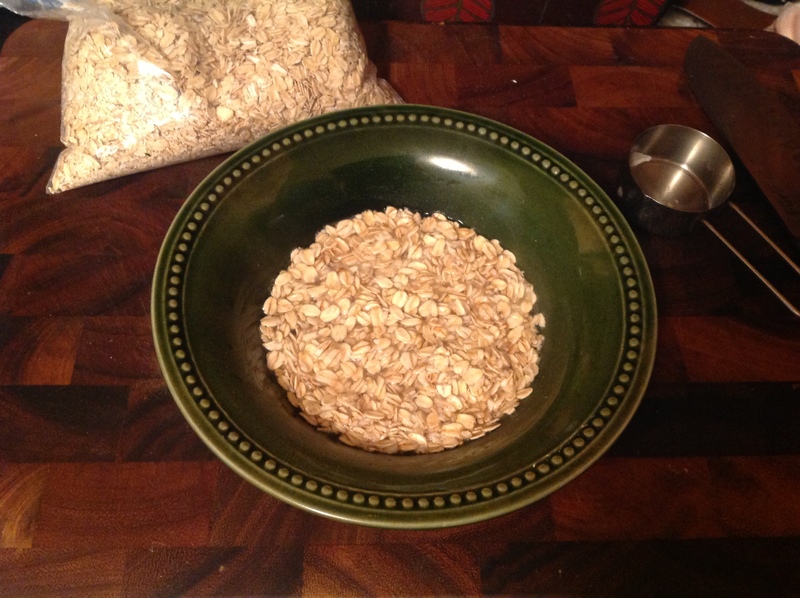 In a bowl, combine the rolled oats and 1/3 cup of the hot broth. 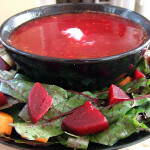 Mix and let sit for 10 minutes or until the broth is completely absorbed. Set aside. In a smaller bowl, combine the vegetable oil, Worcestershire sauce, and Liquid Smoke, if using. Add 1/3 cup broth and the spice mixture. Whisk until smooth. Add the cooked oatmeal and stir until everything is well combined. Add the wet ingredients to the bowl with the dry ingredients. Using a rubber spatula, mix until you have a dough. Then wet your hand and knead the dough in the bowl until it feels smooth and holds together. If the dough feels too wet or loose, add more soy or amaranth. If the dough feels too dry, wet your hands and knead rather than adding water to the dough. You add less water this way. When you are happy with the consistency of the dough, let it rest for 10 minutes. Divide the mixture into 4 parts. Shape each part into a log. Wrap the logs individually in foil and steam them for 20 minutes. Let them cool. Then refrigerate for a few hours or overnight, if possible. This will help them firm up even more. Great article. Just wondering if you could tell me about the ingredient “pea protein”. I can’t find it at my health food store, other than in the protein powders for making shakes. Is that what you are referring to? Hi there- SO happy to have found these recipes! I’m a vegan who has relatively recently gone GF because I discovered that gluten was what was exacerbating my cystic acne! I had a question about the pea protein…all I seem to find are the big tubs together with all the veg protein powder drink/shake mixes in the supplements section of the stores. Is this what you use? Or is there some culinary variety I’m supposed to be looking for? Thanks. 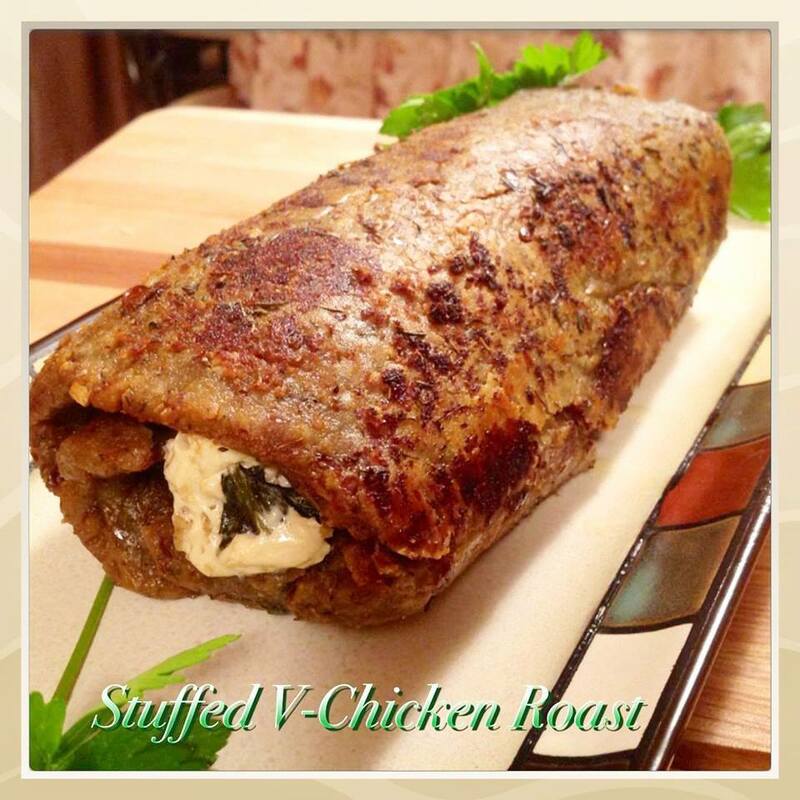 Hi, Rhea, just thought I’d try again to see if I could get some guidance on making a roast…I experimented with the turkey v meat recipe and like it as cutlets just fine, but I’d really like to try to make a stuffed roast like you have pictured. What did you stuff it with? And did you roll/stuff, then steam it? 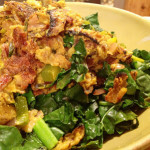 I can’t seem to find a recipe anywhere on your blog. Thanks! Really! 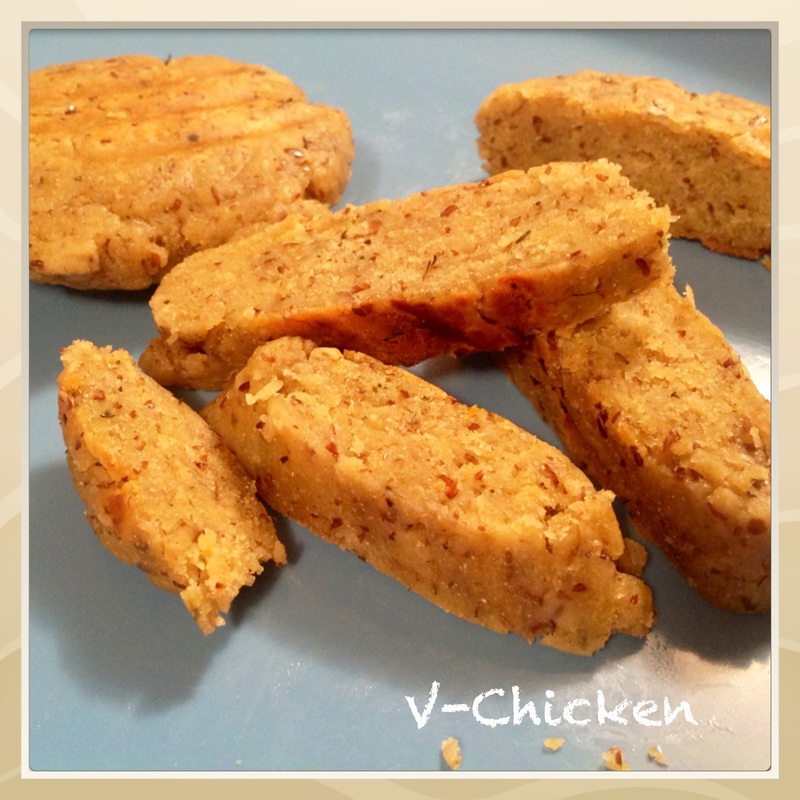 I look at recipes and see this seitan, stop and move on! It would be so useful. I am it sure about meat replacement as it about fifty years since I had meat but I do live with a carnivore and I often do two identical pots of food but one with meat and mine with many good things, lentils, beans, vegetables, and much more! I am a huge fan of spices and late coming to herbs I know but gently getting there! After texture, seasoning is the recipe component that makes meat taste so good. After all, no one just eats plain meat without seasoning it, so why wouldn’t you do the same to vegetables? You can use the same spice mixes on vegetables that you would have used on meat. Poultry seasoning may be marketed for use on chicken and turkey, but guess what? It’s vegan. There is no actual poultry in poultry seasoning just as there is no steak in steak seasoning. These mixes are just blends of herbs and spices we have come to associate with meat. Combine sage, thyme, marjoram, rosemary, celery seed, allspice and black pepper to make your own “poultry” seasoning. Blend chile powder, paprika, oregano, cumin, coriander, mustard powder, brown sugar, salt and pepper to create your own spice rub for seitan steaks. To learn more about spices and seasonings, read “How to Stock Up Your Spice Cabinet for Delicious Vegan Cooking” and then check out “10 Awesome BBQ Sauces, Rubs and Marinades” to get more recipes including a few of my spice rubs. 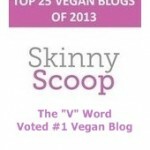 What is your favorite brand on pea protein, and nutritional yeast? You are a life saver. I recently became Vegan again and I am here to stay. Due to some serious health issues I decided to remove soy and gluten out of my life. These recipes are perfect for me. I am also from the Bronx. Born and raised 1971 to 2011. Living in Florida now. Thanks again and many blessings to you. 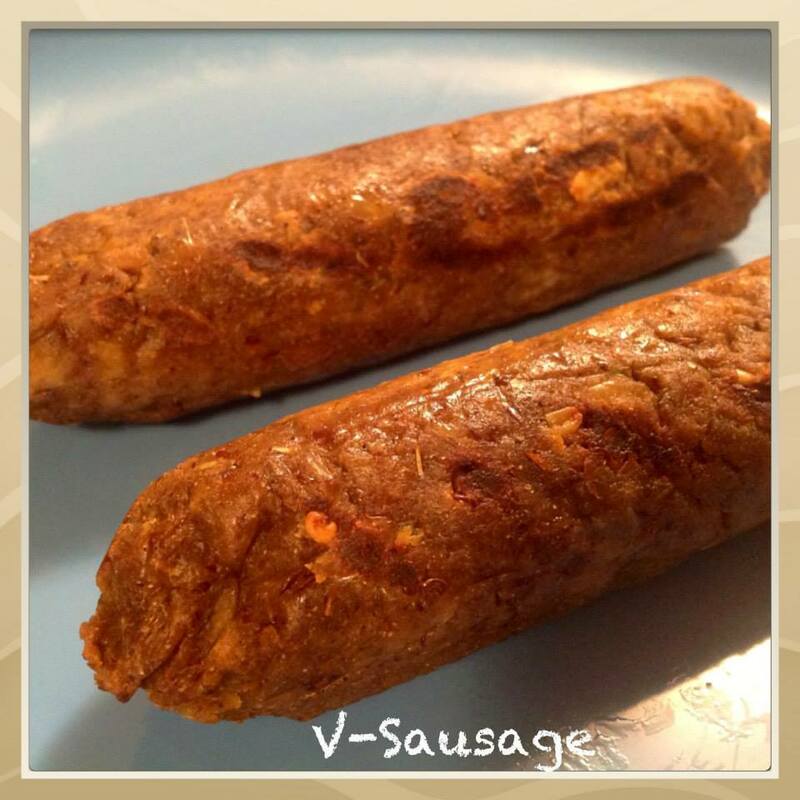 I made the v-sausage last night and it was delicious! I finally found amaranth flour and so I didn’t have to replace it with quinoa flour. In the recipe I could not determine when the final five ingredients listed should be added, so I just mixed them in at the end. Very nice, thanks again! Do you prefer the v-sausage or the spicy Italian sausages made with black-eyed peas? That’s what I do, Diana. Thank you! Sorry for the late reply, Loz. Seitan does get soft in liquid. I always cook my tempeh, tofu, whatever first, set it aside and then put it back at the end. I’m glad you liked it. I froze mine and used it today in a stir fry. It was fine. I stir fried it from frozen, I had cut small strips when I first made it and froze the strips. I love it. Today I made black bean stir fry with it. Next I am going to be a beef stew with it and then my next mission is the v chicken flavour. I was contemplating today, I bet a bacon flavour could be done. Update. 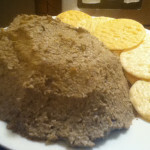 I couldn’t wait until tomorrow to try the beef flavoured v meat I made as mentioned in earlier post. I was in bed and my curiosity got the better of me. I thought, why not, its been chilling in the fridge for a few hours, so I got up, slice a few pieces and quickly stir fried it. Got back into bed with a few pieces, and wow its lovely. Does it taste like beef, I don’t know, I cannot remember what beef taste like, but it is sooooooo tasty, the texture is great, easy to slice into strips for the stir fry, went crispy, but still tender, amazing thank you so much. That is another product I can use to create some more vegan meals. Very creative, I am so happy. Loz, I’m so happy you liked it. I hope you try the other types as well. The chicken was my favorite. Hi Diana, I’m so happy you found me. I understand completely. My husband and I were huge meat eaters. All I ever ate was chicken, I spent my childhood going to the butcher with my mother and eating all meat-centric dishes. My family would go out for ice cream and I wanted a burger or fried chicken. 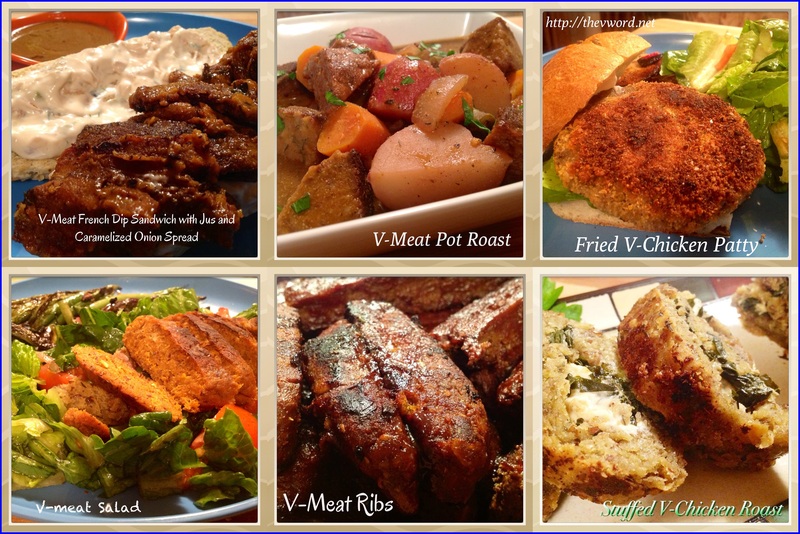 There are some great vegan meats out there but when I became gluten-free, I had to figure out how to keep making my “meaty” vegan dishes. That’s why I figured out the gluten-free Italian sausage on the blog and then tried to make this gluten-free seitan which I think turned out pretty good. Hi Rhea: The V meat came out good. I noticed after streaming them if I brown the meat it does taste better than just steamed. I made a “beef stew” last night and plan to make some chick’n salad. I never had pea protein and wondered if the taste would be very different then the hemp protein. I guess it would be being a different product. The ribs came out excellent when I added some spices to them and browned them. Next trip to Whole Foods will be pea protein. 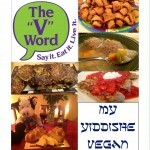 I plan on getting your e recipes and when is your cookbook coming out or am I behind the times? Thank you and keep up the excellent work. Hi Allison, I’m so glad you liked it. Yes, you definitely have to cook it further after steaming just as you would seitan. No one would like seitan straight from the pot. I don’t know if hemp protein would be different. I’m not sure it’s the taste so much as the protein content. If you do try it, please let me know. Made the sausage, beef and chicken V meat. Excited to see how they come out, I used the hemp protein and would like to try the pea protein in the future. 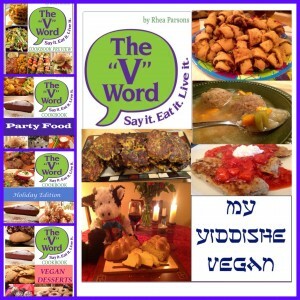 Will bring the turkey V meat to Thanksgiving Day and see how meat eaters respond to the non-turkey. Saved one turkey. Thank you. It looks like only 2/3 of the water with bouillion ends up in the final dough. Is that right? Thanks! Whole Foods didn’t have amaranth flour, so I used quinoa flour. I found that I needed to steam mine longer. Can’t wait to make it again. I’m planning to double the recipe. I’m going to try battering and frying it to make nuggets thanks! I tripled the recipe since I have large quantities of various flours now. 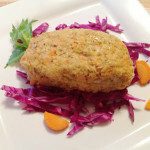 The taste seems fine with quinoa flour instead of amaranth. I’m wondering if it affects the consistency, because both times the finished product seemed too moist. When I sauteed it in a vegetable dish with tamari and lime juice, the v-chicken became wet dough. I’m going to bake some of the finished product to dry it out. Thanks again! I’ll be making this a lot! I’m planning to try this with quinoa flour and some other protein – my pea protein has probably expired (and I’ve read it’s not a good idea to eat that one expired), but I have hemp, rice and sacha inchi. Well, soy too, but I don’t like it. Hey! 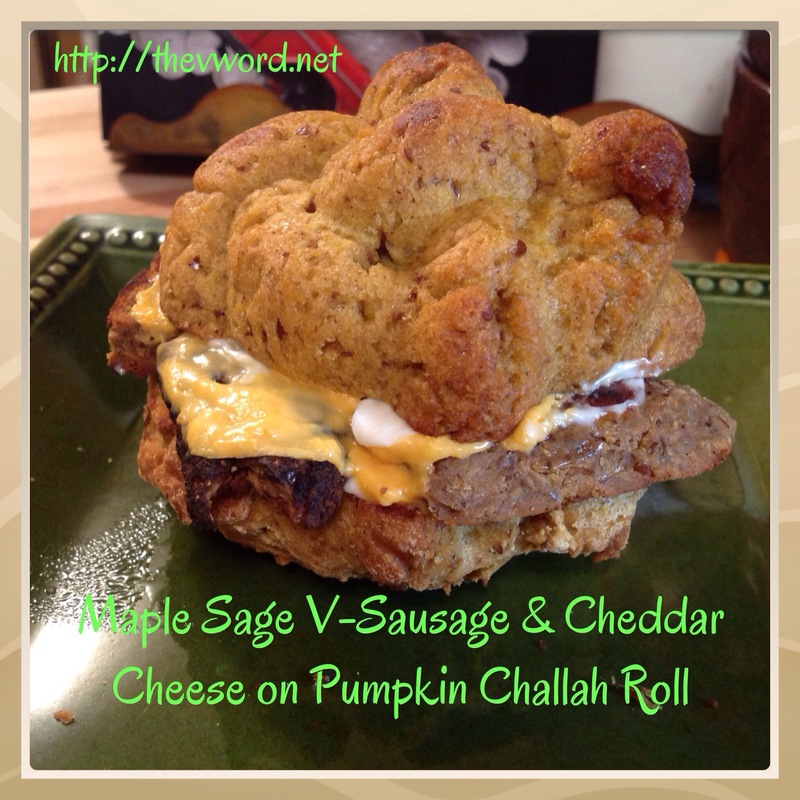 Does the gluten-free seitan slice deli meat style? Thank you! I haven’t, Barbara, but it’s something to try. And pastrami too. That was my favorite. Hi, your recipes look very good, do yo know what I could substitute the soy flour with? I can only guess but I would think so. If you try it, please let me know. I’ve just made the Italian sausage, and I’m so thrilled with the result.It was much easier than I thought it was going to be, and so incredibly tasty! Thank you! I live in the MIDDLE OF NOWHERE and need a ferry to get ANYWHERE. Any sub for the pea protein? I have hemp protein powder and about every other flour there is. Would love to try this without having to go to town. Thanks! Any high-protein flour would work such as quinoa or millet flour. Chickpea, while high protein, did not do well in my tests. 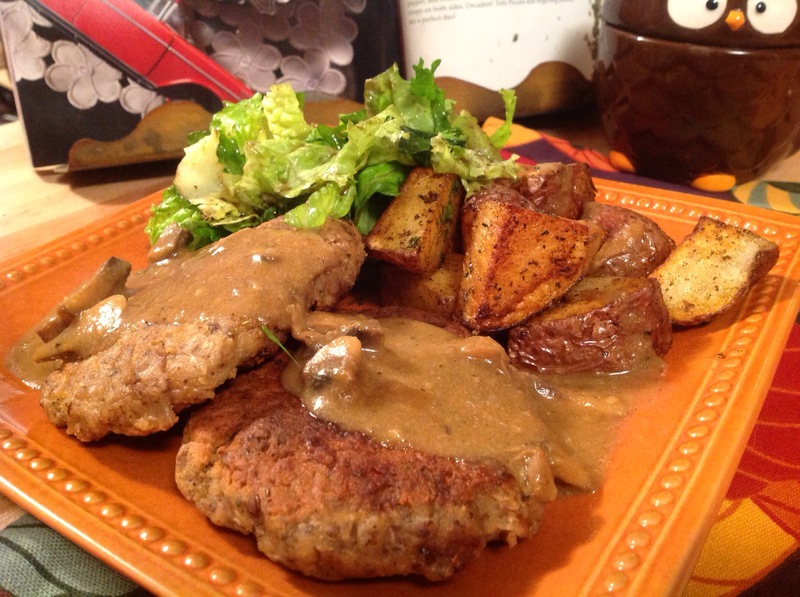 But I must say, if you and your husband can eat seitan, why wouldn’t you? It has a better texture than V-Meat in that it’s softer and a bit chewier. It’s really hard to get that meaty texture without gluten. But if you do try V-Meat, I’d go with quinoa flour, millet flour, brown rice flour and the pea protein. This is SO exciting! 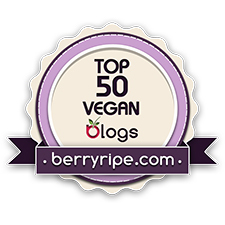 I am vegan with a gluten intolerance (which I sometimes ignore); I’ve been looking at a lot of recipes lately that include seitan. I’m so very excited to give these a shot! Thank you, thank you! 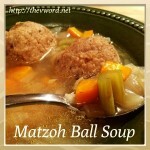 Making this now, but I had one question: what is the last 1/3 cup broth used for? Or is it just extra? I’m using “ham” seasoning from another site, and subbing the soy with quinoa, etc. I’ll let you know how it turns out–fingers crossed! Hi Beth, yes, it’s extra. Just in case. One cube is good for one or two cups water. I keep the extra in the fridge for the next time I need broth. My fingers are crossed too!!!! Hi Rhea, Just wondering what the nutritional yeast adds to the recipe? Would it be possible to leave it out or substitute it with something else? Hi Mark, there are bouillon cubes and broths that are “chicken” or “beef” flavored, not chicken or beef flavored. They use spices and herbs that are familiar to those animal flavors – like sage and thyme for chicken, probably tomato and soy for beef. You don’t have to use those cubes. I’ve made seitan for years just throwing in those familiar herbs and spices but if you really want it to taste like beef or chicken, they work well. Also for soups. Edward and Son make them. I’m sure there are other brands. 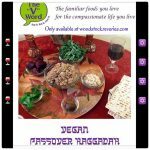 You can order directly from Edward and Son or Pangea (veganstore.com) or Vegan Essentials. Wow! Stoked to try this.. One question, it says 1/4 pea protien..is that 1/4 cup?